A 66-year-old male was seen at an outside hospital presenting with left hemiparesis and left-side neglect. At the outside hospital, the patient was administered tissue plasminogen activator (TPA) before transfer to our facility for possible intervention. 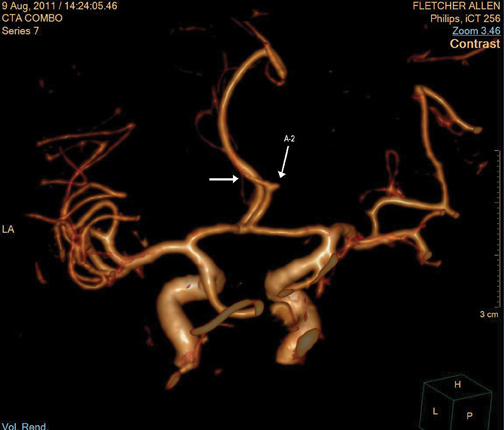 Noncontrast computed tomography (CT), CT angiography (CTA), and perfusion CT images were acquired. 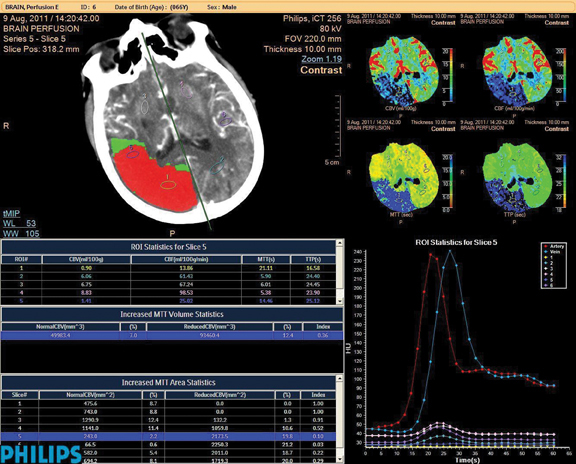 Accurate and efficient postprocessing with the CT Advanced Brain Perfusion and Advanced Vessel Analysis applications (IntelliSpace Portal, Philips Healthcare, Cleveland, OH, USA), allow for quick decisions to be made by the neurology team. 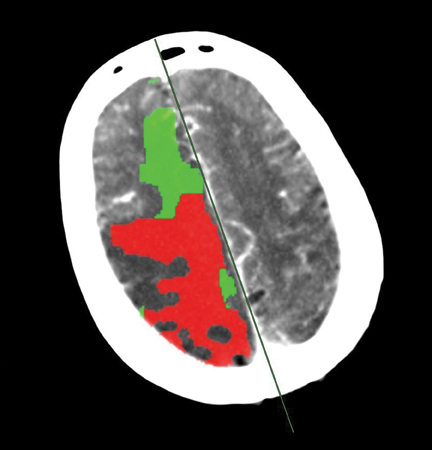 The penumbra/infarct maps (summary maps) give the brain perfusion application an advantage in facilitating these expedient reviews. We can use the summary maps to assess the likelihood of success with an intra-arterial intervention. 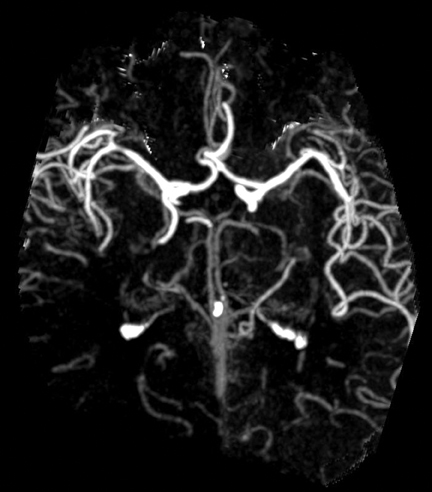 Patients with a large infarct core and small amount of penumbra (brain at risk for infarction) are thought to have a lower success following intra-arterial intervention. On the other hand, in patients with a smaller infarct core and a larger amount of brain at risk, an argument can be made for intra-arterial intervention. 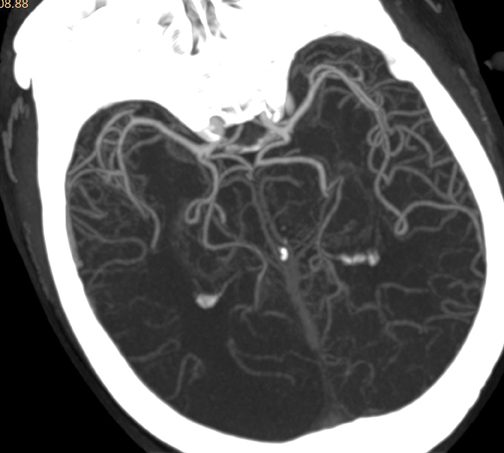 In this case, due to the size of the infarct core, the number of occlusions (2 ACA and 2 MCA branches), and a relatively small area of brain at risk, it was elected to not proceed with intra-arterial therapy. 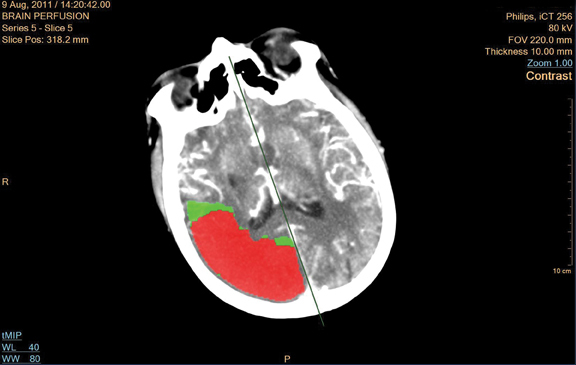 In today’s climate, it was a difficult decision to not treat this patient; however, the advanced imaging made possible with the Philips iCT and the ease of postprocessing the brain perfusion and CTA data with the Philips IntelliSpace Portal made a hard decision easier. 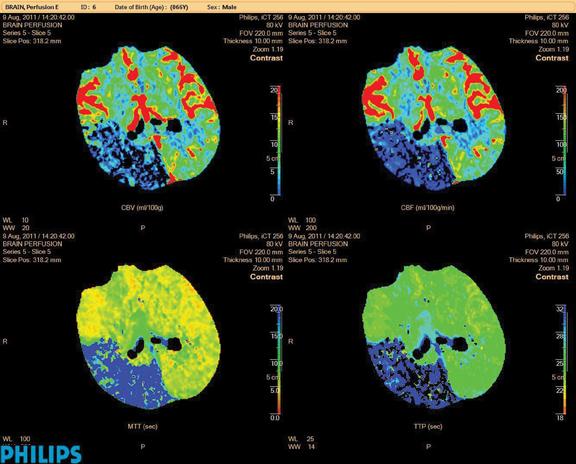 • Summary maps (penumbra/infarct maps), available in Philips’ CT Advanced Brain Perfusion application, support expedient decision making by the neurology team and offer an advantage. • The iCT provides full brain coverage and allows for quantitative analysis when paired with the CT Advanced Brain Perfusion application. 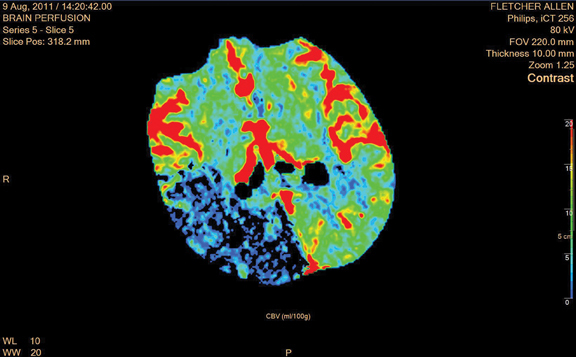 Evaluation of Cerebral Ischemia with Brain Perfusion and the Intellispace Portal. Appl Radiol.